I am convinced Brussels sprouts have magical powers. You try them. And maybe you hate them. But you can't stop thinking about them. And you cant resist buying them the next time you see them because they are so cute. And then you make them again. And your feelings have warmed up to them. And this continues until you have fallen madly in love, and you don't really know why. Most definitely a magic vegetable! I might have picked up crabapples at the market purely because of how adorable they looked. Ok, I definitely picked them up for that reason. And then I thought, well if these are so cute and tiny, and Brussels sprouts are so cute and tiny - then maybe they would work well together! My reasoning skills leave much to be desired, obviously. But regardless of how I managed to get these two together, I liked the how the sweet tang of crabapple paired with our miniature cabbage friends, the Brussels sprouts. The maple syrup, bacon, and rosemary ended up making it a dish we can't get out of our minds. Heat oven to 400 degrees. 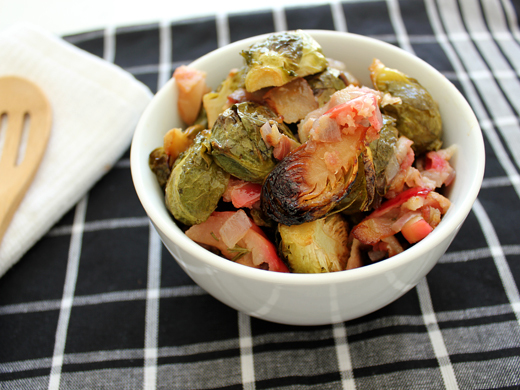 In a large bowl, toss Brussels sprouts, red onion, crabapples, and bacon all together. In a small bowl, whisk maple syrup, vinegar, olive oil, and rosemary. Pour the maple syrup mixture over the Brussels sprouts and coat. Season with salt and pepper to taste. Place on a baking sheet or 9 x 13 baking pan and roast for about 35 minutes, until the sprouts have cooked through and have developed some nice caramelization. Whoa! Talk about an interesting flavour combination!!! I love brussels, and they sound perfect with the sweet crabapples. You are too clever! These brussel sprouts are killing me. I want to grab that bowl off the screen and eat them. I'm one of the oddballs that love Brussels sprouts. They're so perfect roasted--I love the flavors you've added to them! Yup, you've put me in the mood for Brussels sprouts again. I may make them for Thanksgiving this year...I will get the whole bowl for myself! Lovely combination of flavors! I found that I adore Brussels sprouts as long as some sort of pork is made with them. This looks like a delicious recipe. Oh wow. I sooo need to try this!! I've never met a Brussels sprout I didn't like! NOM! I agree about magical powers. I actually never had Brussel sprouts when I was in Japan, and the reason first time I tried this was because they look like mini cabbage and thought it's so cute! Since then I usually have some Brussel sprouts in my fridge, and when they are season I eat as much as I can! My favorite recipe is similar to yours minus maple syrup and I will DEFINITELY use it next time! Thanks for the recipe! This sounds delicious. I usually stir-fry brussel sprouts with some garlic, Hoi Sin sauce and maybe some ginger, and salt and pepper to taste, the Chinese way..hehe.. I will add this to one of the weekend Western meal repotoire ;)!